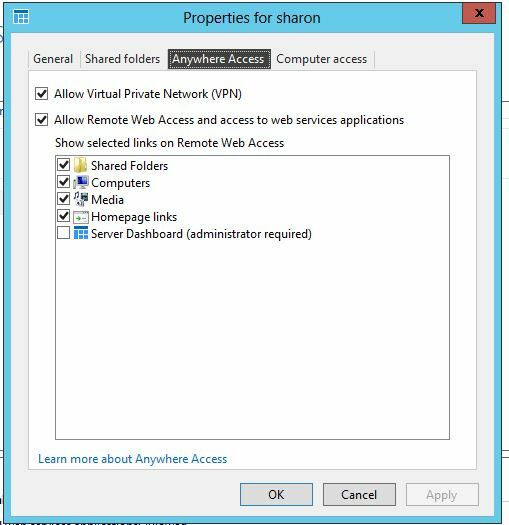 In a previous post (Windows 2012 Server Essentials Anywhere Access – Part 1) I outlined how to setup Anywhere Access to allow your users to securely access their files, and even desktops, from outside the office. 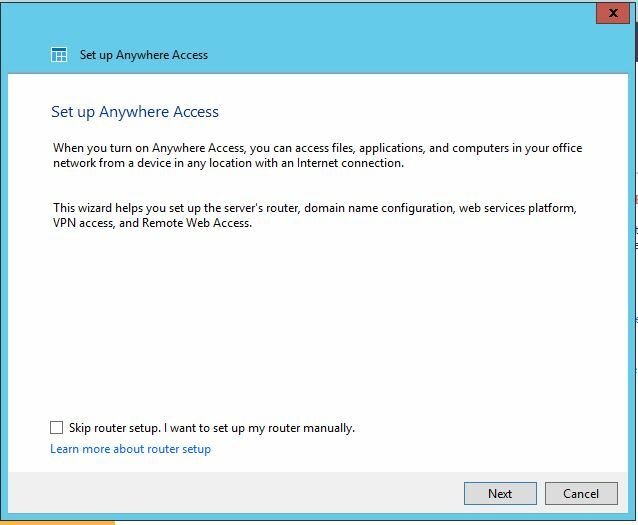 In this post, I will step you through how to connect using the Anywhere Access feature included in Windows 2012 Server Essentials. The images in this post are from a clients system; Windows 2012 Server Essentials. To use Remote Web Access, open Internet Explorer (using other browsers is not recommended). 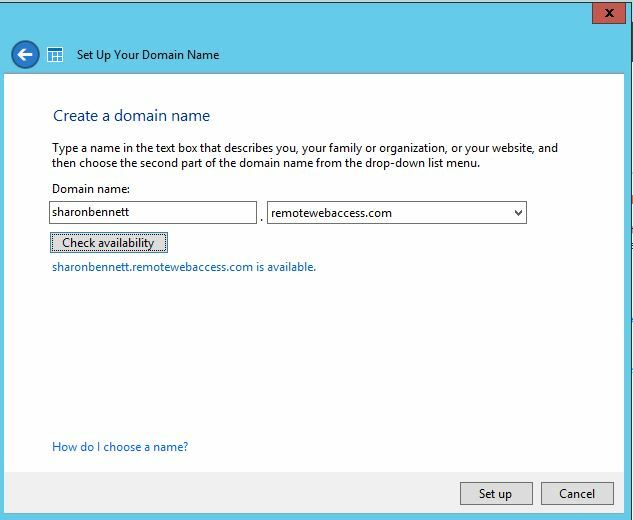 Enter: https://yourdomainname.remotewebaccess.com into the address bar. This address was set up when Anywhere Access was configured on the server. See previous post for details how to do this. 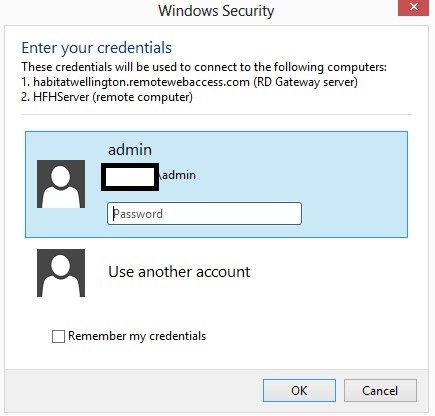 Enter your office network username and password. 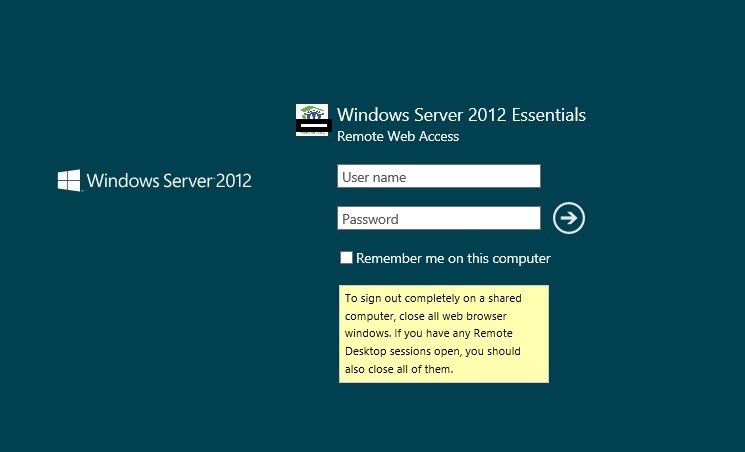 You will now be connected to Windows Server 2012 Essentials server in the office. Users can easily see items they have access too, including their desktops if the functionality is provided. 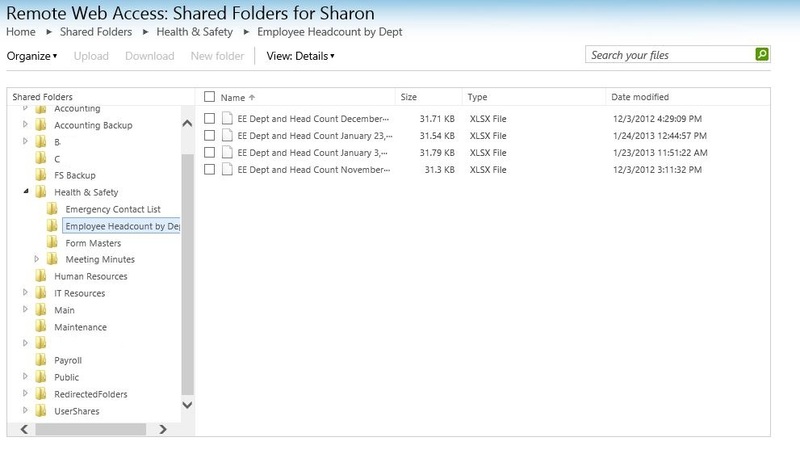 When the user clicks on Shared Folders, a list of all folders is presented. Expand the folders on the left to drill down into the file structure. Here, users can easily upload and download files and create new folders. The greatest advantage to Remote Web Access is the ability for your users to access their desktops as if they were sitting in front of it. The quality and response time is much faster than other remote control programs. To access the systems in the office the users pick the system from the list on the right. Click the Connect button. Clicking the Computers link will present a list of all the computers the user can access. 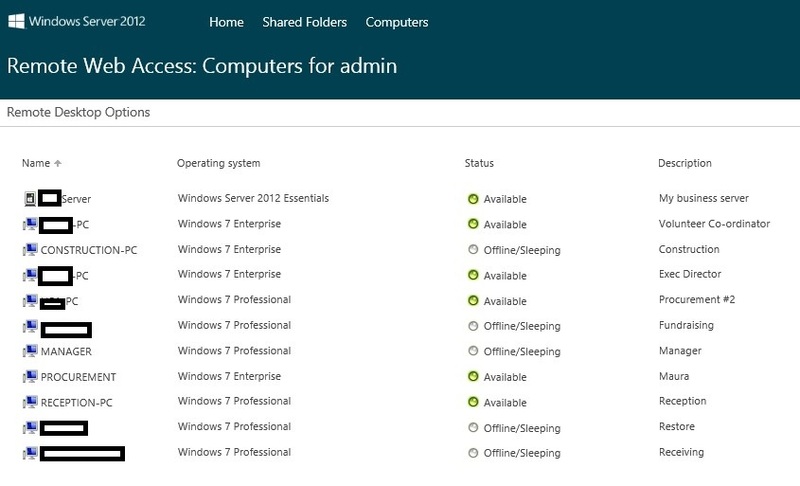 Doing so will also give you access to all the systems you can remote into based on your credentials. You will be required to enter your credentials again. Click on the Use another account link if the incorrect username is already provided. You will now be connected to your desktop. To exit click the X on the menu bar at the top of the screen. 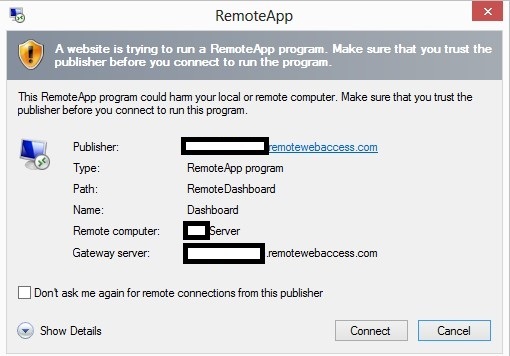 This will close the Remote Desktop Session and take you back to the Remote Web Access Screen. Please be sure to exit out of Remote Web Access by clicking the Sign Out link to the top left of the window. That’s it! You can now securely access your files and desktop from anywhere. Who needs an office? 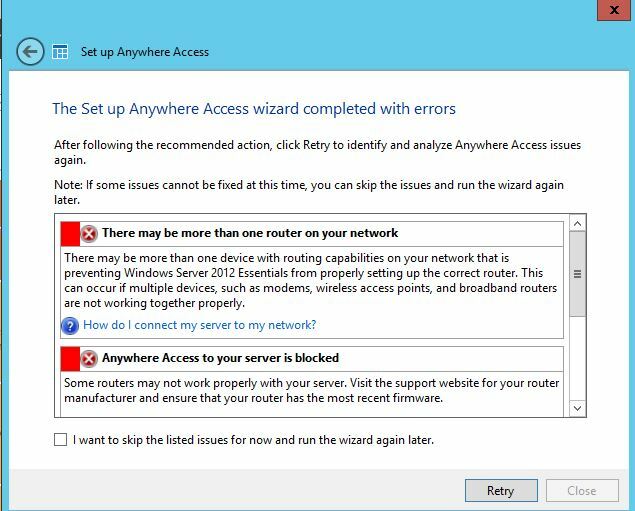 This and the following post are going to be focused on the Anywhere Access feature included in Windows 2012 Server Essentials. As most you know, I love this product. It’s my go-to solution for my clients who require a server that is easy to manage and is user-friendly. 2012 Essentials fits the bill perfectly. It’s designed for small businesses with up to 25 users. This post will focus on Anywhere Access, aka: working in your jammies. (I’m all about the jammies). 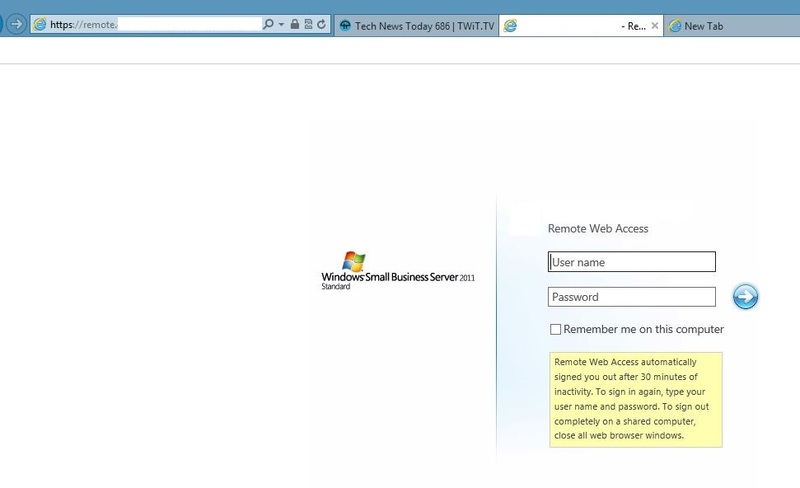 Anywhere Access allows users to connect to the server, and even to their desktop, from outside the office using a web-friendly interface. 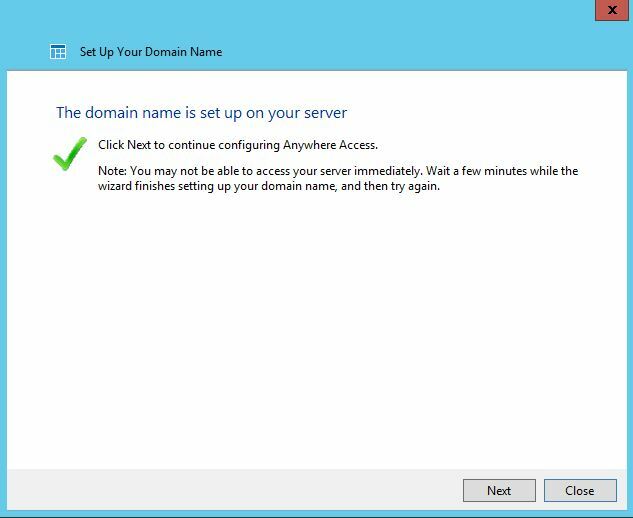 This how-to will step you through configuring Anywhere Access and how it looks to the users. After Windows 2012 Server Essentials is installed, launch the Dashboard, if it isn’t already launched. You now have the option to have the program setup your router, or you can do it manually. Personally, I prefer the manual method, maybe I’m just old school. You will now be presented with a Getting Started window. Click Next. If you have a domain name, you can use it or you can create a new one. This name becomes the url for the users to access the server via a webpage. For the purpose of this how to, I will create a new domain name. Since I don’t want to pay for a name, I’ll get a personalized domain name from Microsoft. 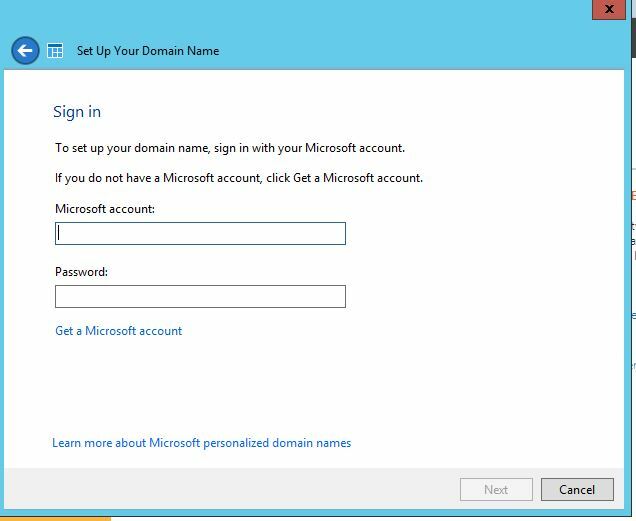 Enter your credentials or create a new Microsoft account. In my case I have already registered a name, but I want to create a new domain name for this post. Enter in the domain name you wish and then check availability. Luckily, sharonbennett@remotewebaccess.com is available (what are the oods?). Then click setup. 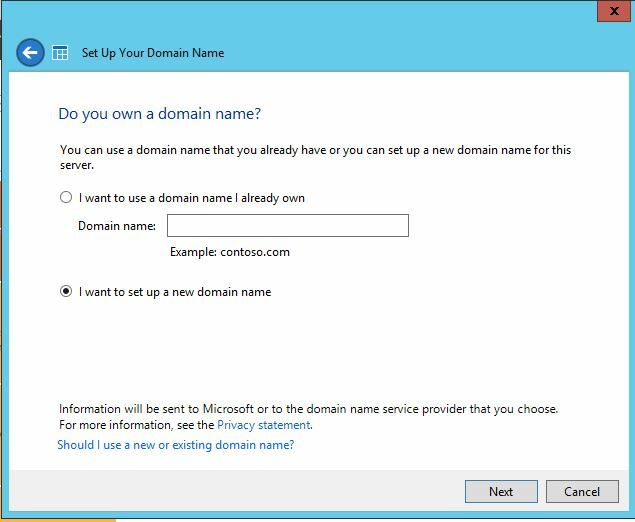 Your domain name is now setup on your server. Please note, it could take a few minutes before you can access Anywhere Access. We can now choose how we want our users to connect. We can enable VPN or Remote Web Access. We are going to select Remote Web Access. The next option allows us to turn on Anywhere Access for our current users and any newly created users. The program will then setup the users, configure the firewall and any other settings that are required for Remote Web Access. The next screen will come up green if Anywhere Access is able to connect to the Internet. In our case it cannot, since we chose to setup the router manually. I’ll skip the listed issues and configure my router manually, then test again. 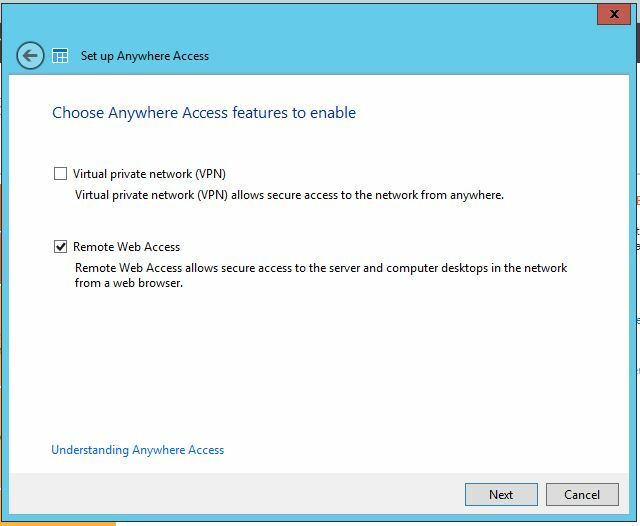 To verify Anywhere Access has been configured, I view a user account and verify the account has Anywhere Access enabled. You will also notice that I can uncheck the options I do not want the user to have access to. And there you have it. In my experience, the biggest hiccup is setting up the router. Remember, your router is your first line of defence against intruders and it’s important that it is setup correctly. Please consult with your local IT pro if you are having any issues. Anywhere Access The Jammies Part 2 (Anywhere Access – The Jammie Part) outlines how to connect from outside the office. Last month, I posted an article about how some small businesses I work with are opting not to replace their aging servers with a current piece of equipment. For details, read “Nas vs Server – Part 1”. As I sat and watched a Windows Server 2012 Essentials be installed, it seemed like the perfect opportunity to expand on the server side of “Nas vs Server”. This post outlines some of the benefits of replacing an older server with a new one, or adding a server to your small business environment. If your company uses Line of Business applications, or requires specific shares or configurations for your applications, a server may be the only option. However, if most of your workflow is cloud-based and minimal in-house file storage is required, a NAS may be the better solution. When I refer to a server, I am referring to a computer with server-rated hardware and a proper server operating system, such as Small Business Server, Server 2008, etc. I am not referring to a Windows XP/7 computer, that is being used to share files to other users. Security – Allows you to control who has access to what data, and how they access it from both outside and inside the organization. 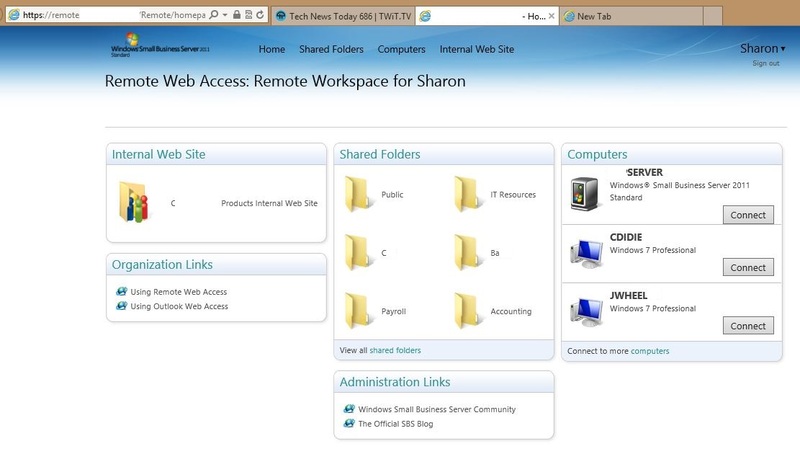 Remote Web Access – Users can securely access their data and desktops from outside the office (there goes snow days). Automatic Desktop Backups – Users no longer have to think about backing up their desktops. The server takes care of this for them, ensuring that their data is always backed up. Patches and Other Security Actions – The server will push updates to the users, and from an easy to read Dashboard you can see what systems are lacking current security measures. There are many options for small businesses. If your workflow is mostly cloud-based, a server may not be necessary, and your resources could be better utilized in other aspects of your business. But if you need more control, flexibility, and growth a server may be your best solution. Talk to your qualified IT professional to see if a small business server would be a good and necessary addition to your IT environment. I was sitting in my jammies earlier today, watching the snowstorm with my coffee, when a client called me. She was unable to go to her workplace because of the treacherous road conditions, but she didn’t want that to keep her from working. She told me, “Sharon, I want to be able to work from home. I know you set up that type of functionality a while ago on the new business server, could you help me get connected to it?” “Of course”, I replied, and five minutes later, she was connected to her office desktop through her home computer. Last fall, I upgraded this client to Small Business Server 2011 Standard, as well as many other additional technical improvements. I love the SBS servers; and with their large variety of features, they’re a great solution for small businesses. The feature this client called me about is Remote Web Access (or Anywhere Access, as it’s now referred to in Microsoft’s latest server operating system), and it allows users to securely access in-house resources using any web browser. This means you can seamlessly work from anywhere with an Internet connection the same way you would at your workplace. Your users can easily connect to your server by entering a designated web address into their web browser. They will then be presented with a very simple log-in screen, as seen above. 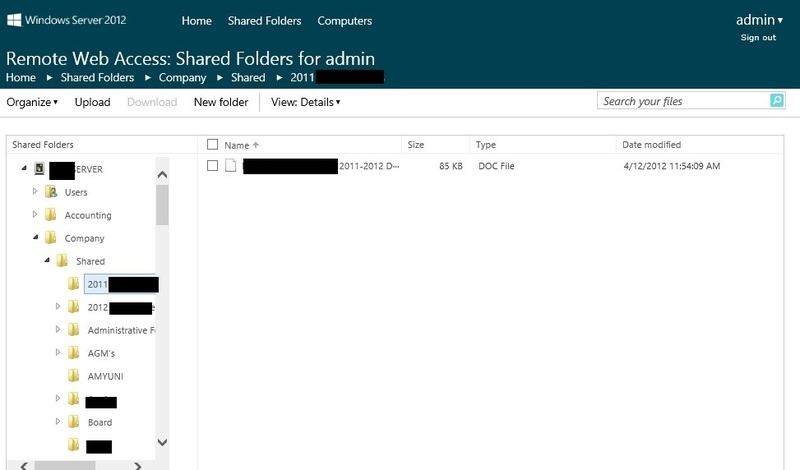 Once successfully authenticated, the user can connect to any of the resources he/she has permission to access; whether it’s shared folders on a server, desktop or (depending on the version of SBS installed) the internal SharePoint site. Users can upload and download files as necessary, depending on their access rights. In the picture above, the account is an administrative one, and has access to all folders and computers. As a bonus, I can remotely support businesses using Remote Web Access and Remote Desktop; which allows me to address issues without having to physically be on-site, reducing the business’s downtime. Remote Web Access is just one solution to allow your team members to work remotely. Talk to your certified IT professional about what solution will best meet your team’s needs. As I move more small businesses to the cloud, my clients’ dependence on an in-house server continues to decrease, and more of them are choosing not to replace outdated servers with another one, but instead, with a NAS. I recently worked for a client who had a server that needed to be replaced. After determining their current and future needs, we decided to replace the server with a NAS (Network Attached Storage). This company has 8 employees, 5 of which who work on-site full-time, with 7 out of 8 employees using laptops. 95% of the businesses’s workflow is cloud-based; and they keep very little data on-site. The employees only need to share their documents with one another and have them available for future reference. In this case, a server would have been overkill for their needs, but if the company’s line of business applications were on-premise, a NAS would not be suitable. Cost – for the most part, a NAS is much less expensive than a server and its licensing. Hard Drive Redundancy – NAS manufacturers offer a choice of RAID options within the device. For the small business, I recommend RAID 1; this means both hard drives contain the same data, therefore if one hard drive fails, the data is still available on the second drive. Keep in mind, this configuration is not a replacement for off-site backups, and an off-site backup should always be part of your data recovery strategy. For the “3-2-1 Backup Strategy,” click here. Access Control – you can control and customize each users access (if any) to the data stored on the NAS. Other Options – remote access, online backups, desktop backups, etc. A NAS may be the perfect solution for your small business, but talk to your qualified IT professional before investing in this technology. A NAS is a great solution for businesses that require basic file storage and limited functionality, but it is not a substitute for the advanced functionality and security of a server-based environment. 1. Be aware of the “Awesome Deal” A software/hardware deal that sounds too good to be true probably is. For example: a desktop computer (depending on hardware) with a Windows 7 operating system from Future Shop starts at around $500, and this is without MS Office. Office 2010 Home and Business is another $350. Getting the whole package at $350 would be more than a clearance sale. 2. Purchase from authorized dealers When purchasing software, ensure you or your IT support are purchasing from authorized dealers, whether it’s Microsoft, Adobe, Future Shop, etc. 3. Always ask for proof of purchase If your IT support is purchasing the software on your behalf, make sure you have a copy of the official receipt from the vendor. This will ensure that if you ever have an issue with the software, you are entitled to software support. 4. Always ask for the product or license key Ensure you have the appropriate product or license key (i.e. Microsoft sticker on the side of the computer, a license key within the packaging, an official document from the vendor, etc.). You should have a valid product and/or license key for each copy of software that you have purchased. If your IT support purchased the software on your behalf, they should be providing you with proper documentation from the vendor with the product or license key. Again, this ensures that you can contact the vendor for support if required. 5. Purchase currently supported software Your brand-new system should have current software. For example: a system purchased in 2012 should come with Microsoft Office 2010 (the latest release is Office 2010). 6. Purchase the correct edition for your needs A small business with less than 25 desktop systems would not need Enterprise Edition, designed for environments with 250+ desktops. A better solution would be Windows Small Business Server Essentials for Windows Server Standard. These 6 guidelines will help you avoid potential scams and ensure that both you and your data are protected. Have you ever felt unsure about your software? Are You A Prisoner To Your Tech Support? It’s Monday morning and you come into the office to discover that your network is down for unknown reasons. You call your IT Professional, only to find out that he/she has been in a serious accident and is in critical condition. You quickly Google for another “tech” in the area, and call and explain the situation to him/her. As each moment passes, you are unable to do your job. Later that day, you see your “geek angel” in the front lobby and you are immediately relieved knowing your problem is going to be fixed. He/she takes a look at your infrastructure, and tries to access some resources. He/she suspects it’s a problem on the server, and needs an account with administrative privilege to resolve the issue. You look at the specialist, and with a sinking feeling, you realize that you don’t have passwords, account information, or any other useful documentations, and the situation quickly goes from bad to worse. Those of you who know me will hear me refer to the “hit by the bus file”. This is a file, paper or electronic that documents your entire IT implementation. Consider this…one day you need IT support and you call your “IT guy” and find out he was crossing the road and was hit by a bus. You now have to bring in someone else who has never seen your systems or implementation before, and this new person will have to figure out how your tech fits together before he/she can even start to assist you. He/she can’t start to take anything apart to troubleshoot if they don’t know how to put it back together again for your implementation. It’s very much like a completed puzzle. You can see how all the pieces fit together, but without the picture on the box to refer to, the puzzle may not easily go back together again if some of the pieces need to be modified. Your IT support person is also not un-replaceable. Any person who holds your IT structure to themselves is (in my opinion) either selfish, lazy, or is hiding something. Yes, this may sound harsh, but in my experience, it almost always comes down to one of these three factors. 1. Selfish – they want to feel like they are a key element of your companys structure. You and your data are now hostage of your IT support. 2. Lazy – they don’t want to take the time to document your structure. This should be part of the contract, and a professional will always include this. 3. Hiding Something – they might not use legitimate/legal software and this could be their way to hide it (follow-up post to come). You are now at the mercy of whoever holds your information. You are trapped. As a small business owner, you need to be responsible for both your data and network. This file should be updated whenever there is a change to the infrastructure. For example, you change your ISP, or add a new file server. As someone trying to help you, there is nothing more frustrating than realizing the documentation you have is not accurate. Keeping your documentation current and accurate is critical in protecting your data. If your IT specialist (either on contract or on payroll) does not provide this information, you are at risk of becoming a “prisoner”. Take the case of Terry Childs, the network administrator for the city of San Francisco. He refused to give up the administrative passwords to his supervisors, and it cost the city almost $900,000 USD to regain control of their own network. This is an extreme case, but it demonstrates what can and has happened. What is the cost of your systems being unusable? What if those systems are down for an extended period of time? What would it cost for someone to have to figure it all out before fixing it? If you don’t have current IT documentation, call your IT Specialist and ask, or if need be, demand that this documentation is updated or created. Don’t be held captive by your IT support.